Story Contracting has won its biggest ever contract, an £8 million project to build an opacification plant for Innovia in Wigton. This will play a vital role in the production of polymer bank notes for the Bank of England. Work is due to start on site on Monday and will take 12 months to complete. Carlisle-based Story beat off stiff local and national competition to clinch the deal. Story Contracting employs more than 300 people and has carried out work for Innovia – and its predecessor company UCB Films – for more than 25 years. The Bank of England announced in December that it would introduce polymer £5 and £10 notes, which last longer than paper notes and contain a clear plastic window that makes them harder to counterfeit. It confirmed in March that it has entered into an agreement to use Innovia Security’s Guardian material, which will be manufactured at Wigton. Innovia has invested £20m in a new ‘Bubble’ facility at Wigton, which is nearing completion and will boost production of polypropylene film by 10 per cent. 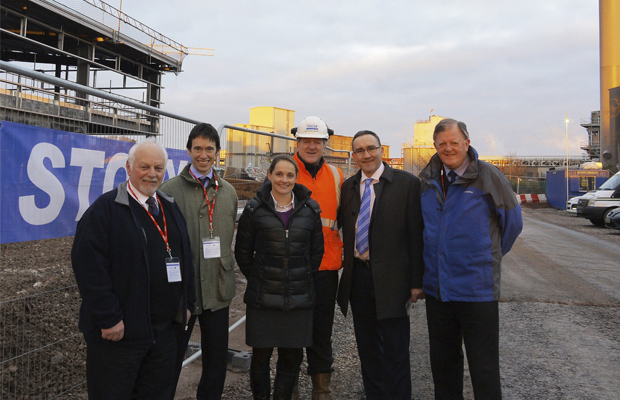 It is investing a further £20m in the high-security opacification plant. This will take the transparent Guardian substrate and give it an opaque coating for printing at De La Rue’s specialist bank note printing works in Debden, Essex. Story’s success in clinching the contract is good news for local sub-contractors who will work on the project. They include Border Steelwork Structures of Carlisle, which will supply the steelwork and cladding. David Downie, managing director of Border Steelwork said: “We’ve worked for Innovia [and its predecessor] since 1988 and in the mid-1990s we did the technical work on a new plant in Australia. We went over there and managed that project for them. Border Steelwork is due to start on site on October 20 and will be working there for 14 or 15 weeks. The two projects combined will bring it £2m worth of business. Polymer bank notes were first adopted by Australia in 1988 and Innovia’s Guardian is now used by 23 countries. The Bank of England says the move to plastic notes will save £100m over a decade. The £5 note, featuring Winston Churchill, is due to enter circulation in 2016 with the £10 note, depicting Pride and Prejudice author Jane Austen, following a year later. They will be slightly smaller than the current £5 and £10 notes.